"On the road again ... "
Enjoy the start of the tournament! See ya soon! Hey all, I'm gonna be a little out of reach for the next few days as the fam is vacationing right now. Enjoy Cincy! OK, here we are: quarterfinal time at the Masters tournament in and no American men made it that far. Actually, none made it as far as the 16s. This all coincides with the history-making turn in the rankings this week, where no U.S. man was in the top 10 for the first time in oh, about, forever. And Sam Querrey has won more titles than anyone not named Rafael Nadal in 2010. Look at Mardy Fish, too: Even though his winning streak in singles was snapped in Washington last week, he still took home the doubles. Americans have brought home a lot of hardware this season. No muss, no fuss, and it looks like Americans are doing OK here to me. The whole system needs an overhaul: Why isn't Juan Carlos Ferrero being rewarded more for three titles won? Or Davydenko penalized for a poor season? Maybe the Race was the way to go after all. Well, first thing I probably wouldn't be doing is typing this blog entry: I'd be doing laps in my swimming pool filled with my millions! Seriously, though, if I was him, you know what I would've done over the past couple of weeks? (And this may sound crazy) Played either in L.A. last week or Washington this one. I know: Crazy, right? But not really if you look at it. First, I know there have been some bouts with injuries this year, but his schedule's been pretty light. I'm assuming if he's about to play the two Masters events coming up, then he's in pretty good shape now. I don't think an extra week of tournament play would've hurt him. And speaking of that extra week, for whatever reason the ATP's been doing this with it's 32-spot draws and awarding byes to the top four seeds, he only would have had to play four matches to win L.A. That tournament probably would've been best for him, actually, because it was a couple of weeks before the big ones start cranking up. Then there's the confidence factor: January was a looonng time ago, which is the last time he won an event. Granted, it was a big one, but the months since then have been very un-Federer-like. I just have to assume L.A. would've been the perfect spot to break the title-less drought. A run to the finals even would've been decent: He doesn't even have that many runner-up finishes this year. Also, if I was Federer, I wouldn't have brought in Paul Annacone on any kind of basis. All Annacone is going to have him do is try to get to net more. I should've typed that sentence earlier, I could've saved Roger possibly tens of thousands of dollars! I don't know if you were doing much Pete Sampras watching back in the mid-to-late '90s, early 2000s, but Sampras' game changed completely. Pete wasn't simply a serve-and-volleyer, which he morphed into the later years. He was an all-court player that could hang with almost anyone out there on the baseline. If you get a chance, look at footage of him in the 1997 Australian Open finals, when he destroyed a young Carlos Moya. He was slugging it out with him from the back of the court. You can say Sampras did alright in his career (that was an obvious understatement), but I feel that Annacone took him from the direction that Tim Gullickson was steering him in and actually cost him a couple of Slams. Getting into net more would probably help Federer against those lumbering big boys like Tomas Berdych and Robin Soderling, but I just have this feeling that Rafael Nadal, Novak Djokovic and Andy Murray will eat him up if he starts increasing his approaches. 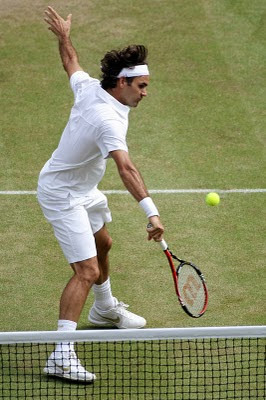 I guess we'll see what Federer has in store upon his return. I might would've done things differently over the past few weeks if I was him, though. But I'm obviously not, so let me return to my dreams of swimming in pools filled with dollar bills! I just wanted to give a quick wrap-up of the tournaments that wrapped up this weekend. And you know me, I have some kind of opinion on the results! 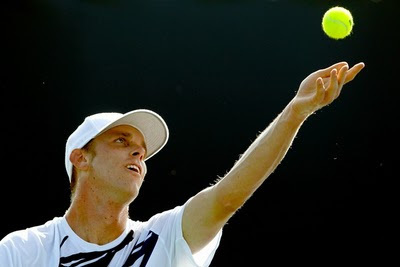 * First, let's start in L.A., where Sam Querrey defended his title over Andy Murray by notching his first win over the top-four player. Great win for Sam and an incredible effort to fight back like he did. Bad loss for Murray, though, who I feel needed to come in and just dominate the tournament for his confidence. And check out this post at Adjusting the Net, pre-final, for more thoughts on both of them heading into the match. And while we're in L.A., how about them Bryan boys? Historic effort! Whenever they do something big, I always break out this old post on their place in the game--and all of sports. * In Stanford, Victoria Azarenka beat Maria Sharapova quite handily to take the title. Congrats to Azarenka and to Sharapova, too, for a good run at a decent-sized tournament. I'm still waiting for Maria to show she can come out on top again at a big event. Maybe this is the start? And how about Lindsay Davenport? The doubles court beckons! * Juan Carlos Ferrero won his third title of the year in Umag. I liked how afterward he said he was confident on getting ready for the hard-court season. He's been getting it done on the dirt, but it's time to move on! * Also expressing confidence after his win was Nicolas Almagro, who took the Swiss Open crown for his second title in three weeks. Nic said his goal is to get in the top 10 and stay there. Good luck to him. And on that note, I'll end it here. Congrats again to the winners!